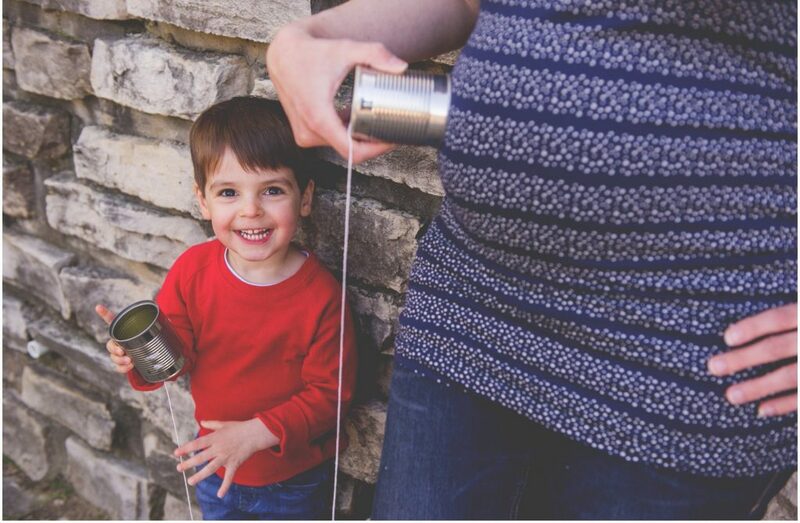 Special Spring Portrait Session Opportunity for Chamber Members! 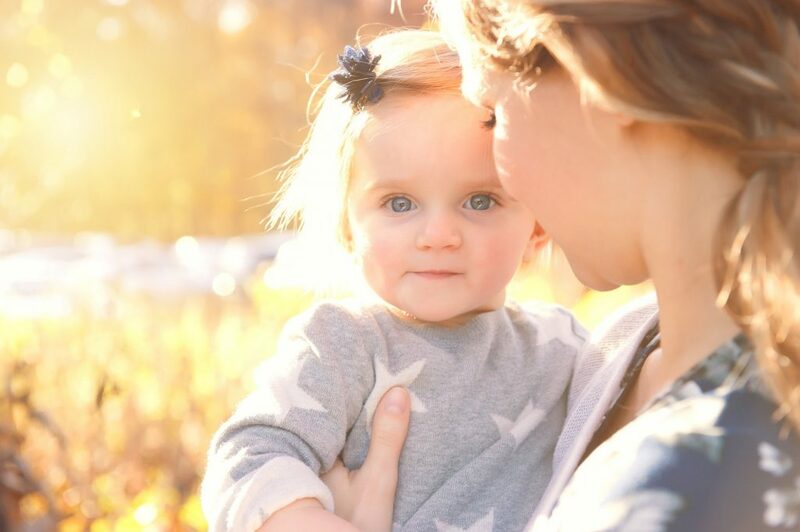 Chamber Member Laura Meyer Photography is offering a limited number of special Mother’s day sessions. You can learn more about the sessions and book your special portrait session by clicking the link below. Contact Laura to hear more about special rates for Greater Oak Brook Chamber of Commerce Members! Join Child’s Voice at Kendra Scott! 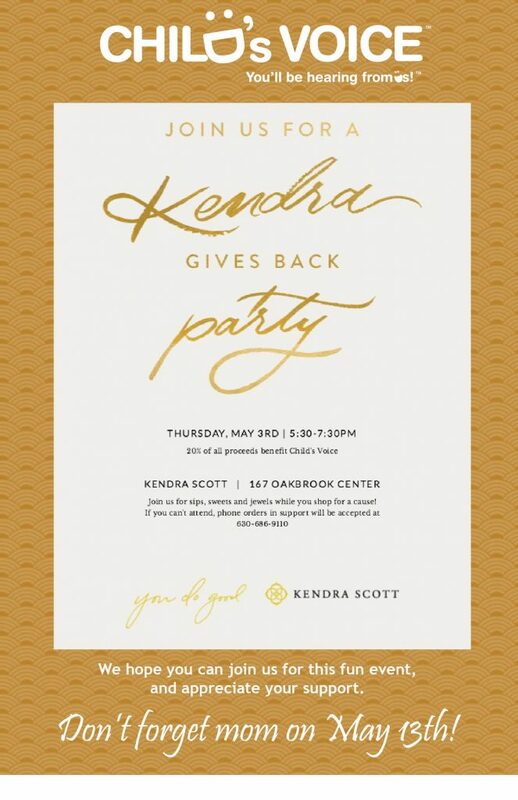 Kendra Scott has partnered with Chamber Member Child’s Voice for a special giving back party. Details are below! Oak Brook Polo, which was privatized from the Village of Oak Brook 2016, is led by Chicago business leader, Jim Drury, whose passion and commitment to the sport of polo is what’s kept it alive for so many years. Oak Brook Polo Club heads into its 96th season as one of the nation’s oldest polo clubs in operation today and the fourth oldest sports property in Chicago. 2018 marks the 40th anniversary since the last U.S. Open Polo ChampionshipÒ which was held at Oak Brook in 1978. The success of the “International Polo Series” continues with three international fixtures spread across the season including Mexico, Jamaica and Great Britain. The teams will compete for some of Oak Brook Polo’s most revered trophies, including the Drake Challenge Cup and coveted Butler International Cup. Oak Brook Polo has the continued support of sponsors, some of which will have special events taking place throughout the season. 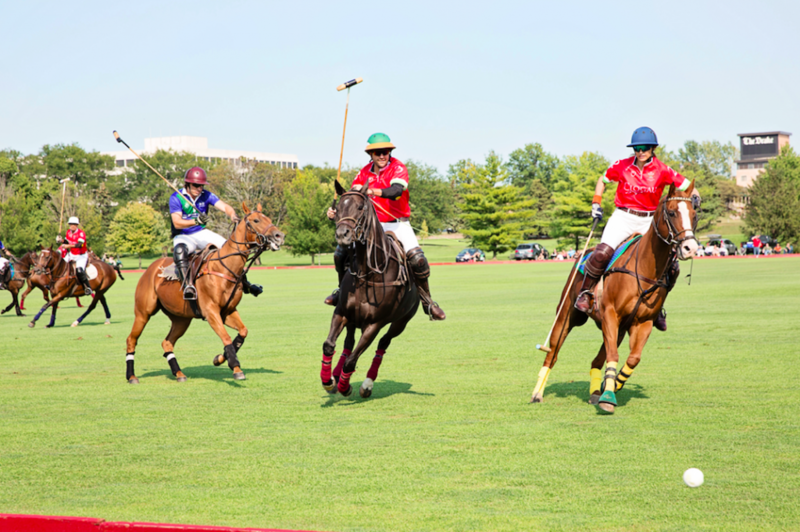 The Drake Oak Brook Hotel will host a pre-match “Sunday Polo Brunch” while Gibson’s Bar & Steakhouse will be the preferred destination for post-match entertainment. CutWater Spirits will feature a “best tailgate” contest and Room & Board will outfit the Saddle Club with luxury outdoor furniture. Other new and returning sponsors include; Michigan Avenue Magazine, Veuve Clicquot, Merrill Lynch, Make It Better, Hinsdale Magazine, David Yurman, Land Rover Hinsdale, Barrington Saddlery, Valley Air Services, FIJI Water, BNY Mellon, and many more. All ticket holders will have access to The Drake Oak Brook Hotel bars, which will be serving up Classic Pimm’s Chukkers and Veuve Clicquot Champagne, and Gibson’s Bar & Steakhouse pop-up restaurant. Prices are as follows: $10.00 per person for lawn seating; $45.00 per car for tailgating; $40.00 VIP (includes field-site seating in Saddle Club and champagne during divot stomp); $85.00 Brunch and VIP and Saddle Club access; $300 Saddle Club Reserved Tables (seating for up to 8); $300 Saddle Club Box (elevated seating overlooking field for up to 6); $650.00 Private Field Side Tent; $750.00 Saddle Club Skyboxes (for up to 12). For ticket information, event schedule, parking directions and general information, please visit www.oakbrookpoloclub.com or call 630.368.5095. 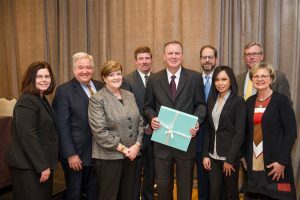 Oak Brook-based Leaders Bank has captured the 2018 Exceptional Service Business Award from the Oak Brook Chamber of Commerce. Leaders Bank officials received the award at the Chamber’s annual meeting and awards breakfast, which took place on Tuesday morning, March 20th at the Hyatt Lodge in Oak Brook. According to the chamber, the Exceptional Service Award is given yearly to an area organization whose customer service program provides an exceptional experience for its clients or customers and makes its business successful. Several factors combined to convince the Chamber Leaders Bank merited the prestigious honor. These include prioritization of personal attention to customer needs, a culture empowering employees to take ownership of quality service and a committee approach to addressing customer issues that yields innovative service solutions. Positive customer satisfaction surveys bear out the success of these initiatives. The bank embraces a collaborative management structure fostering employee empowerment at all levels, Brucato said. Employees understand that positive financial results for shareholders and employees can only be achieved if customers feel well served in every interaction. That spurs strong employee ownership of, and accountability for, continued client satisfaction. In an era of technology-driven change that often results in reduced face-to-face interaction with customers, Leaders Bank employees actively seek opportunities to personally meet with clients, helping build rapport and trust. The bank’s committee approach to addressing challenges spurs communication and collaboration among all bank departments, generating optimal solutions. 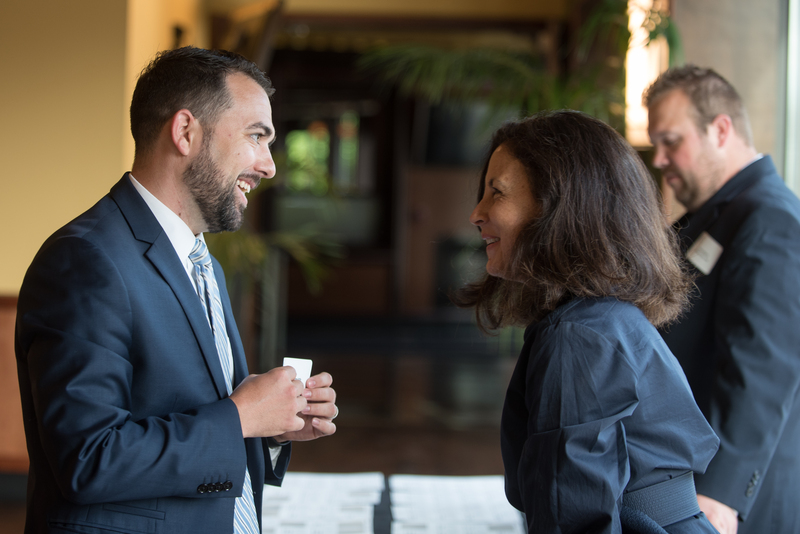 Examples include adjusting ATM transaction dollar limits to minimize fraudulent transactions and instituting loan programs and products that respond to underserved but growing markets like micro businesses, Brucato said. A recent survey conducted by an independent marketing organization confirmed these programs’ effectiveness. It found 95 percent of respondents believe the bank always delivers on promises, and 96 percent would recommend Leaders Bank to others. With locations at 2001 York Road in Oak Brook and 2075 Calamos Court in Naperville, Ill., Leaders Bank is a premier commercial bank catering to private business owners, their families and other entrepreneurs. Leaders Bank offers a full spectrum of traditional and customized banking services, Internet-based banking, and online bill payment. To contact Leaders Bank, call (630) 572-5323 or visit www.leadersbank.com. Source: Leaders Bank/Walt Denny, Inc.